Super Vegiehills Value Pack 900 tablets Super Vegiehills contains ingredients to provide nutrition and healing. It contains high amount of Vitamins, Minerals, Enzymes. 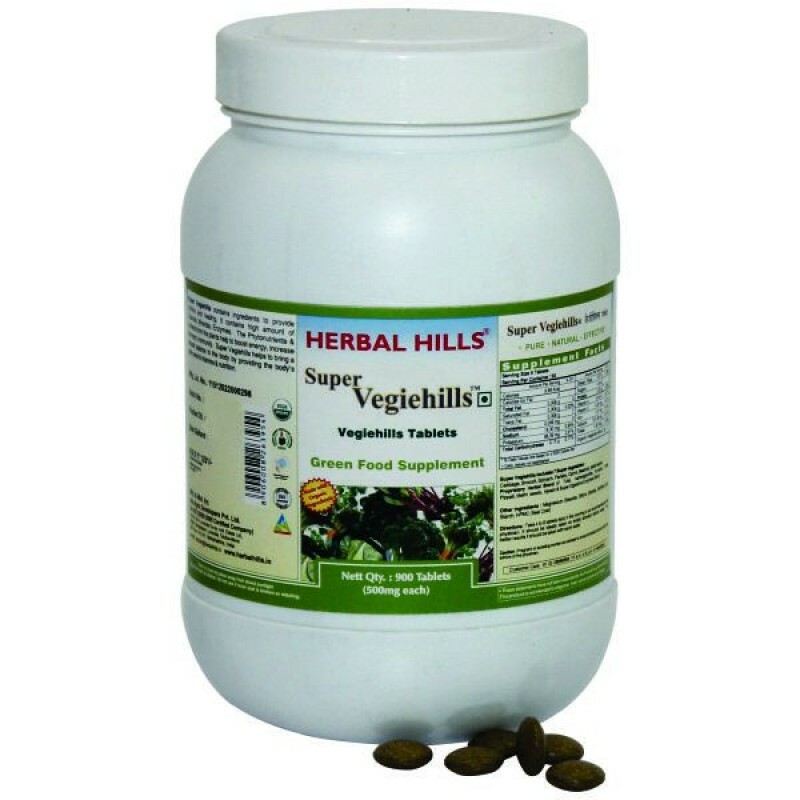 Super Vegiehills contains ingredients such as Cabbage, Brocolli, Spinach, Parsley, Carrot, Beetroot, Methi leaves etc. - Cabbage and Broccoli help to reduce cholesterol levels. - They are also very good anti-oxidant and anti-inflammatory - Spinach is a rich source of dietary fiber as well as Iron which helps to treat anemia. - Beet Root and Carrot are excellent Eye Tonics. These also help in increasing the hemoglobin levels in the blood and treat anemia and reduce fatigue. They also possess anti-oxidant and anti-aging properties. Carrot is a rich source of beta carotene, which is a wonder nutrient for the skin, eyes and nerves. - Methi seeds help in weight management and Cholesterol control. Methi is also considered to be an excellent anti-diabetic.Benefits : - Rich source of dietary fiber - Acts as an excellent tonic for the eyes, skin and nerves. - Antioxidant and helps to enhance Immunity - Helps manage healthy cholesterol levels.